The company specializes in aftermarket parts manufacture mainly for Japanese and Korean cars, as well as for European and American cars. Every months 100-200 new items goes into manufacture. 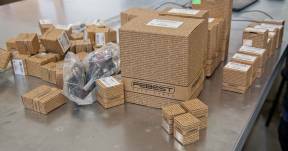 The corporate group FEBEST, founded in 2007 in Germany, has nowadays its representative offices on all continents, and it has no competitors when it comes to the range of rubber aftermarket parts manufactured by the company. At the same time, it is actively developing other vectors of aftermarket parts manufacture. Having taken off with the manufacture of spare car parts for Japanese and Korean cars, the company is paying more and more attention to European and American models, being supreme to its competitors in, inter alia, its efficiency. Despite its size, the concern is characterized by perfect mobility, and by the time the warranty for the first cars of the new production line is over, FEBEST is already able to offer its customers aftermarket parts, perfectly knowing which spare parts will exactly be in demand. Our analytics work in close cooperation with car service stations, who inform the company of the weak spots in the new cars. Every month the amount of items manufactured by the company in accordance with the customers’ requests is increasing by 100-200 units.